In order to import your existing accounts and claim all your funds you need to choose Import Keys. If loading the file files with invalid format please ensure that you have followed the steps described Exporting Your Wallet and make sure to click Import Keys and not Restore Backup. Here you can provide the wallet backup file produced from BitShares 0.9.3c and the pass phrase. Depending on the size of your import file, this step may take some time to auto-complete. Please be patient. The wallet will list all of your accounts including the number of private keys stored in the account names accordingly. The more often you have used your account, the higher this number should be. Confirm by pressing Import. 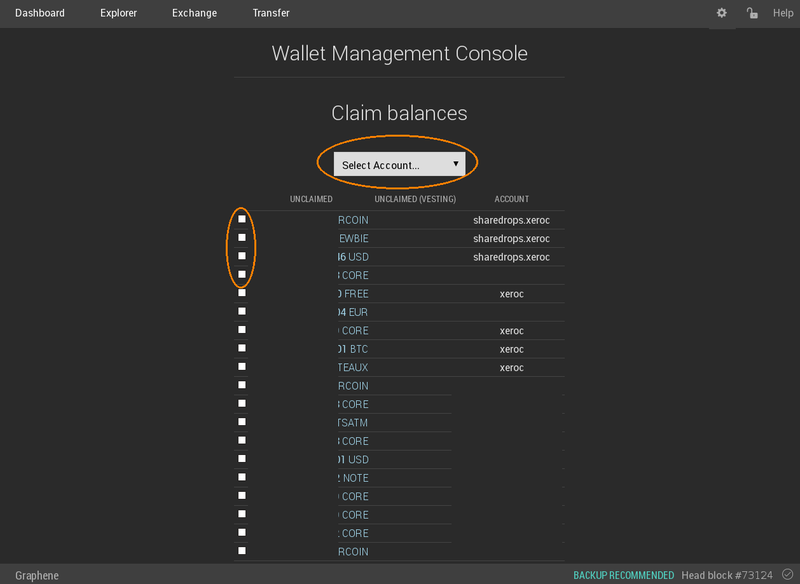 The wallet management console will now give an overview over unclaimed balances. If you click on Balance Claim you will be brought to this screen. You are asked to define where to put your individual balances if you have multiple accounts. After confirming all required steps, your accounts and the balances should appear accordingly. After importing your accounts and balances, we recommend to make a new backup of your wallet that will then contain access to your newly imported accounts and corresponding balances. Note that this doesn’t automatically claim the balances. In the release tag, this will create a full backup of the wallet after every key it imports. If you have thousands of keys, this is quite slow and also takes up a lot of disk space. Monitor your free disk space during the import and, if necessary, periodically erase the backups to avoid filling your disk. The latest code only saves your wallet after all keys have been imported. If you would like to preview this claiming transaction, you can replace the true with a false. That way, the transaction will not be broadcast. But I always import my accounts and then use the GUI to import my balances cause it’s way easier.